I Love the combination of pumpkin and cream cheese. They compliment each other extremely well. 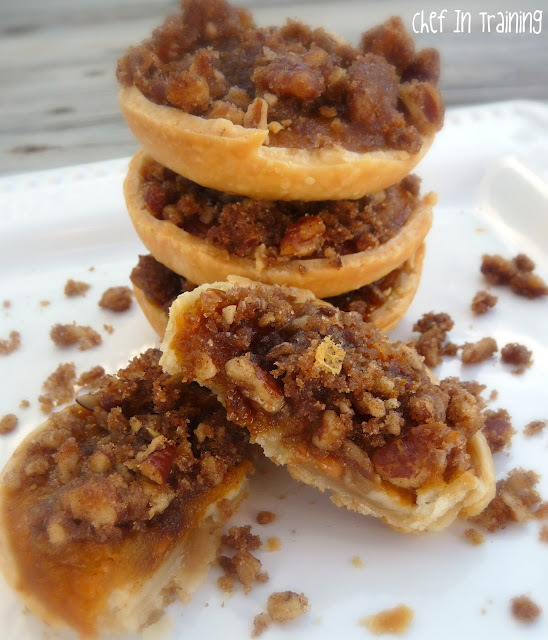 These little pies make for a fun appetizer, dessert, or just a great little snack! My husband went on travel a few weeks ago, so I packed up my kids and we went to my parents house to visit. My dad LOVES pumpkin pie, so I decided to make him up a batch of these yummy mini pies. He couldn’t stop raving about them! I loved them and so did the rest of my family! Cut 2 1/2 inch rounds out of your pie dough and place into 12 muffin tins. You will need to re-roll your dough once. In a mixing bowl, beat cream cheese, sugar and vanilla until softened and smooth. Spoon 1 teaspoon cream cheese mixture into bottom of pies and spread around the bottom. Sprinkle about 10 butterscotch chips over cream cheese layer. In a separate mixing bowl beat the pumpkin, sugar, cream, cinnamon and egg until well combined. Pour evenly over cream cheese mixture filling up to nearly the top of crust. To prepare streusel topping place sugar, cinnamon, ground cookies, brown sugar, pecans and butter in a mixing bowl. Use a fork and press butter into sugar mixture until crumbly. After the pies have baked for 20 minutes remove and top each evenly with the strudel. Place back into the oven for an additional 10-15 minutes or until streusel is bubbly and pies are cooked through. Remove from oven, loosen edges with a plastic knife then let cool for 10 minutes before removing from muffin tins. Serve room temperature or chilled. Yum! My mouth is watering. Oo wow, these look and sound fabulous! I can imagine how delish pumpkin and butterscotch (oh and streusel topping) would be together. Pinned! This looks wonderful! No wonder your dad is happy! All the pumpkin yummies in bloggerland is making me drool! I just made some pumpkin puree today, as I have not seen canned ones over here before! I guess, reason is, pumpkin is available whole year round over here! Thanks for sharing! Have a lovely day! Heaven help me!!!! Those looks awesome! I love this combo too! Yummy!! Those are SO cute! You are right about pumpkin and cream cheese complimenting eachother. Delicious! This recipe looks amazing. Oh. My. Goodness. Looks amazing! In these blog there are so many things which is really very cool and fantastic these all are very excellent also so much other things, which are great to know about it. Wow! This looks fantastic! I shared your link on my Facebook page. Oh my!! They sound and look wonderful!Thanks for sharing all your goodies with us at Show & Share! Could you perhaps do this as a single large pie instead of the little ones?